The EasyLink 12 enables you to access all applications of your smart phone and thus to fully participate in today´s ever-growing mobile information society. 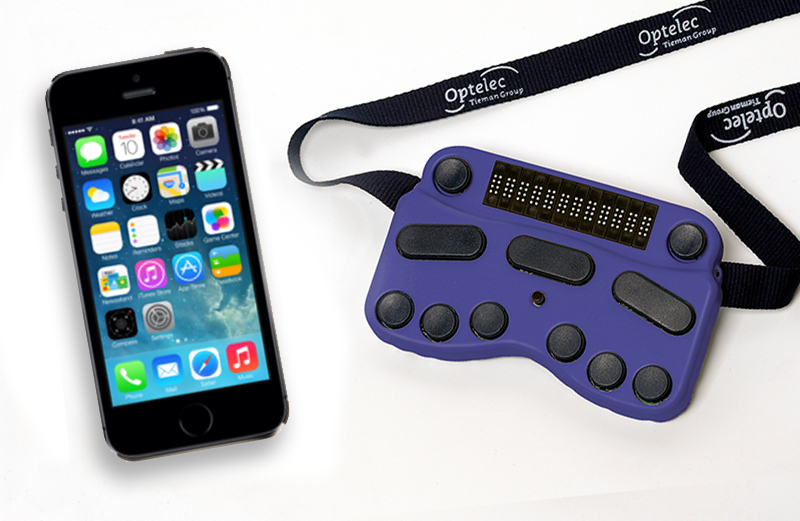 Connect the EasyLink to any phone or tablet using a screen reader such as Mobile Speak or Apple VoiceOver and enjoy using this small, portable Braille device. Offering a display of 12 Braille cells and a keyboard composed of 6 ergonomically-placed Braille input keys, the EasyLink 12 allows you to effortlessly receive e-mails, send text messages, chat with your friends and browse the internet, all in Braille. Thanks to the EasyLinks Clipboard function, the EasyLink 12 as a stand alone device enables you to enter important information such as phone numbers or addresses and transfer these later to a smart phone or a tablet. 12 Braille cells for reading. 6 Braille input keys for writing. Integrated rechargeable battery, offering 10 hours continuous use. Dimensions: 5.9 x 3.8 x 0.8 in.